The iridescent deep blue upperside of the male of the Dark Caerulean would probably make it the most attractive species of the Jamides genus. However, its diminutive size often means that it is either overlooked in the field. The underside is greyish brown with the usual striations of the genus. The tornal area on the underside of the hindwing features a large orange-crowned spot and vein 2b has a filamentous white-tipped tail. This individual was photographed at a recent outing at Pulau Ubin. Preferring to hide quietly in the shade, it perched on the tip of the leaf for quite some time, allowing almost every member of ButterflyCircle on that outing to take a shot of it. 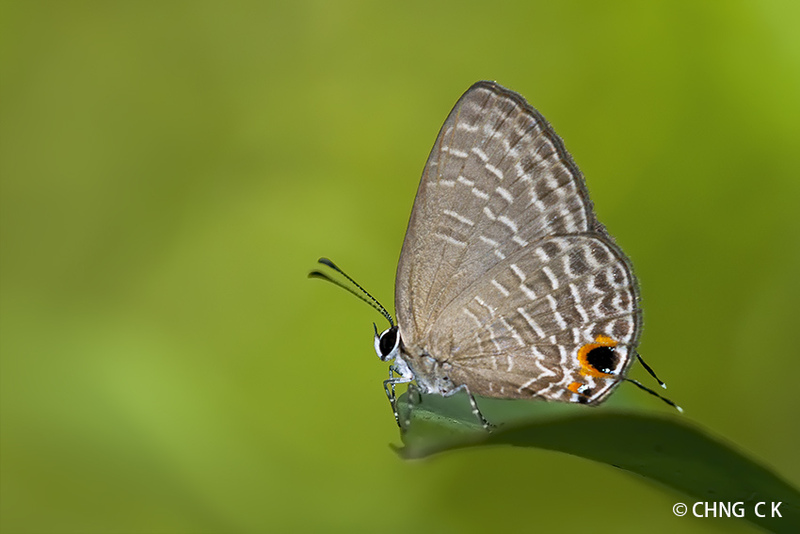 This shot was the work of ButterflyCircle member Chng CK.